Are you guilty of the 'sins' of nervous body language while speaking? Here are 10 signs that you may be exhausting rather than energizing your listeners! I’ve been attending some interesting talks lately, and I’m exhausted. How can that be, I've wondered? As an audience member I’ve been sitting quietly and relaxed and, I hope, attentive. I certainly haven’t been expending any energy. But all the movement I've been witnessing on stage has been making me feel like I’ve run five miles! Could it be that these speakers are all on edge? The answer is actually much simpler. What I’ve been seeing—and what any of us can sometimes be guilty of—is just nervous body language. What exactly does that mean, and how can you become aware of whether you're using it? Want to speak with maximum impact and influence? Learn how to achieve and maintain focus! Download my free cheat sheet, "10 Ways to Stay Fully Focused when Speaking." First, it's important to understand that your body is one of your most important tools of communication. In fact, it’s one of the reasons you deliver presentations in person. Your physical presence plays an essential role in your effectiveness. Try a simple experiment: Imagine you’re about to discuss a topic you're passionate about. Stand in front of your imaginary listeners and try as hard as you can to persuade them—without moving a muscle. Stand in a grounded position, keep your hands at your side, and set your face into a totally neutral expression. You're missing something in your ability to advocate an idea powerfully, and you feel it as much as your audience. That's because when you speak on stage, your posture, stance, position, gestures, facial expressions, and the emphasis you create through physical expression, all depend upon your body and how you use it. Your topics will only come alive when you embody them physically. And audiences will be engaged and moved by what they see! In other words, physical expressiveness should emerge organically from your commitment to your ideas and your need to get them across. But when it doesn’t work well for you—when nervous and extraneous body language intrudes—audiences find themselves distracted. They pay more attention to the sideshow of too much movement over what you’re saying. Remember, the most important visual you show in every presentation is yourself. And so you should definitely work to improve your performance at every opportunity. 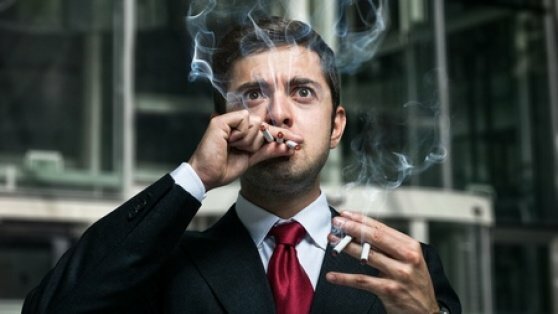 One way you can do it is through learning the 5 key body language techniques of public speaking. Below are the 10 biggest mistakes you may be making along these lines. Think of them as The Top 10 Signs of Nervous Body Language. Be on the lookout for them! This is the speaking style that more than any other gives audiences that I-feel-like-I’ve-just-run-a-marathon sensation. Motivational speakers love to use this technique to generate excitement. Remember, though, it’s your ideas that are exciting. Get your body involved when those ideas excite you as you talk about them. For audiences to retain your key messages, your movement has to be purposeful. Map out where you want to be on stage for each main point. When I work with clients on achieving purposeful movement, I use the designations of the theatrical stage: Down-center, Down-left, Up-right, etc. Use them in your own mind, deciding where you'll position yourself to help audiences retain what you're saying. For instance, three main points = three positions on stage. You'll be helping yourself improve your influence with audiences! Here is nervousness personified, that is, in the person of the speaker. There are no specific gestures to name here, and that’s really the point. Random movements may keep listeners fascinated by your perpetual motion machine, but they'll also pull their focus from what you’re saying. Here’s a striking example of on-stage fidgeting in a TED talk. Videotaping yourself in practice sessions is a great way to train yourself in supportive body movements. One habit that may leap out at you is a tendency to sway back and forth. If it looks like you're resisting a stiff gale with shifting winds, you're a swayer. Seeing this on video will probably be a great incentive for gaining more control of your stance. 5. Stepping Back and Forth. This is purposeless movement in the opposite direction: a tendency to move backward and forward rather than from side-to-side. It’s another example of a speaking habit you may be totally unaware of, but one that can drive audiences nuts! Again, using a video camera or your smartphone will give you a valuable heads-up. 6. Leaning to Port or Starboard. Here’s the third entry in a trio of physical habits you may not realize you have, but that video will reveal to you. Wherever you stand politically, leaning noticeably to the left or right when you present will deprive audiences of a visual representation of your poise as a speaker. Have you seen this interesting body language tic? The speaker will glance back to be sure the right slide is displayed, then step hurriedly away from the screen each time. 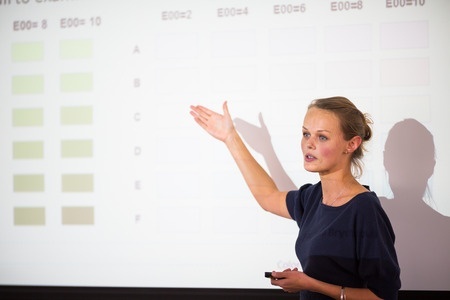 We all know that PowerPoint can be coma-inducing, but it shouldn't look like it's actually attacking the presenter. 8. Retreating from Your Main Points. In some talks, the speaker will step backward when bringing up each important point. It’s a visible sign of nervousness in front of audiences. You should, of course, move toward your listeners when you say something they need to know! 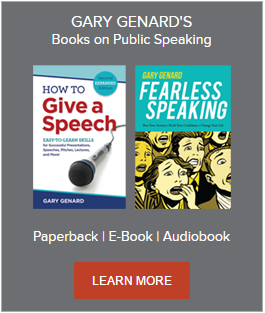 At The Genard Method in Boston, we specialize in helping speakers who suffer from speech anxiety. Learn more by visiting the Fearless Speaking page on our web site. 9. Looking to Your Screen for Help. Speakers who experience self-consciousness or anxiety on stage often grasp at “life preservers.” One of these is the PowerPoint screen. The people in the audience may be strangers to you; but your content seems familiar . . . and safe. So why not keep going back to familiar territory? Talking to your slide may seem like a way to survive a sea of strangers, but it’s tough to convince people of anything if you’re not looking at them. Finally, body language nerves may manifest themselves not as extraneous movement, but no movement at all! You may not be wearing a deer-in-the-headlights look, but discomfort that freezes you in place is still a tip-off. A disembodied voice is great for horror movies, but it doesn’t wear well on the public speaking stage. Again, get your body into the act. This article was originally published in 2015. It is updated here.